Imagine making thousands of dollars a year from a hobby you love. Millions of people just like you are using their creative talents to make big money. With the help of the nation's top expert on this topic, Barbara Brabec, so can you! She gives you everything you need to kniow to launch a lucrative home-based business. Packed with dozens of moneymaking ideas and success secrets of more than 100 professional crafters and industry experts, this guide shows you how to start your own home shop, sell your work, make money selling how-to articles, teaching, and much more. Opal Leasure from Madera, California says, "... the author does an excellent job of showing others "how-to" sell, market and otherwise, expand, their home based business endeavors. 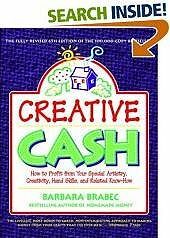 Creative Cash outlines hundreds of ways to market crafts including party plan (hostess) selling, home shows and boutiques. It also reflects on how one thing can lead to another, in life, and your own small business. Many listed, myself included, went on to self publish their own how-to books. I was very happy to note in the book, that Barbara included a resource section listing the professional crafters mentioned in the book. This is a good way for readers to benefit from the talents, ideas and creativity of many people ..."